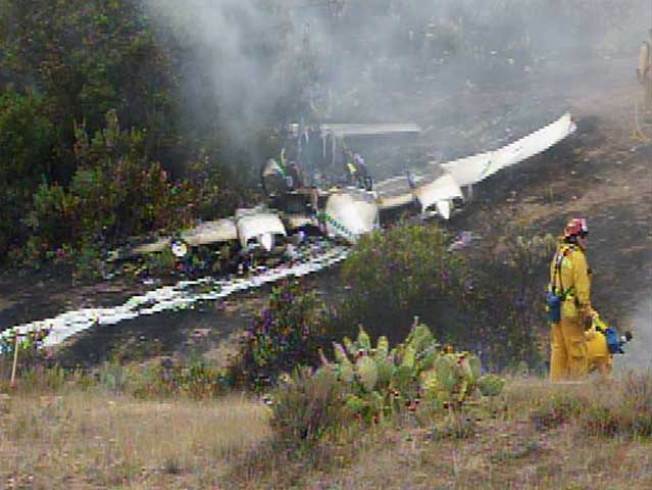 Three people were burned Sunday when a small plane crashed Sunday near the airport on Santa Catalina Island. The twin-engine Cessna 310 crashed at about 3:40 p.m. near the island's airfield, Airport in the Sky. The 54-year-old pilot told a sheriff's sergeant that he arrived on the island from Santa Ana earlier Sunday to pick up two passengers, and just after takeoff his left engine failed. The pilot began emergency procedures and the plane crashed about a half-mile southeast of the airport, said Los Angeles County sheriff's Capt. Mike Parker. Parker said the passengers were a 50-year-old man and 48-year-old woman. All the victims were taken by helicopter to hospitals. "They were very, very fortunate," Parker said. All were in expected to survive. No names have been released. The crash sparked a three-acre brush fire, Parker said. It took county firefighters about an hour to knock it down. FAA records showed the registered owner of the 1956 Cessna is Sabovich and Sons, Inc., a construction company in Arroyo Grande, Calif., near San Luis Obispo.